“Where are we going?”, charcoal on paper, March 2017, all rights reserved. Posted for Brendan’s prompt on real toads about fools. This entry was posted on April 1, 2017 at 10:12 am and is filed under drawings, Uncategorized. You can subscribe via RSS 2.0 feed to this post's comments. This is very lovely, Karin. I like the girl as landscape and of course, the herd of elephant. I find this inexpressibly sad. A lot of life following the reaper’s walk offpage. Did you dream this? Last night I dreamt of cooing a frightened swan out of a dark cocoon. It had come to trust me and life outside that nest. Then a friend who recently committed suicide blew up the nest. I felt so so sorry for the bird; where would it go now when it needed to retreat? Hi Brendan, that sounds like a very sad dream indeed, and all too much like daily life. 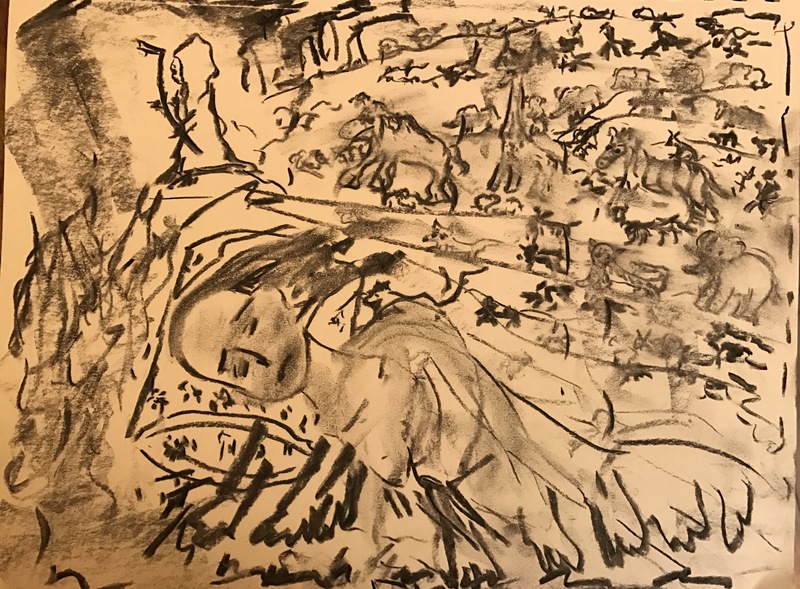 I did not dream mine, but have been doing a lot of dream-like drawings–sort of dream-like–trying to just be very open in terms of what I put into them. I am lucky as I have very little ego about my draftsmanship! (Ha!) So, it makes it easier to be sort of free. Such a sad time. I loved your poem. k.